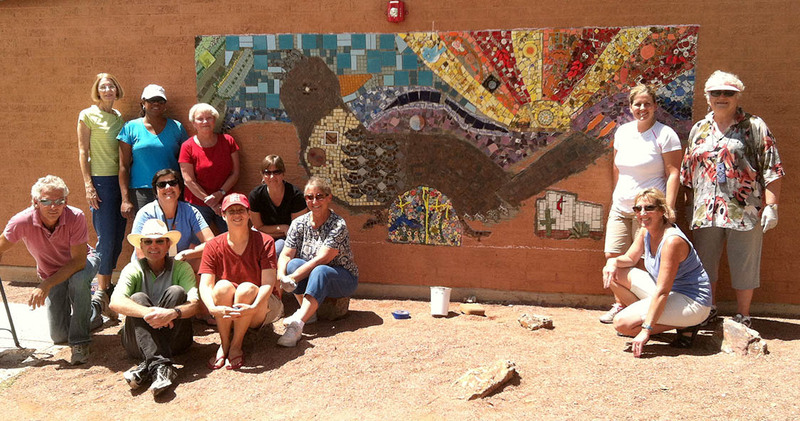 This mural was designed by St. Mark’s UMC Bits and Pieces and dedicated to the school in 2013, to commemorate ten years of partnering between St, Mark’s and Nash Elementary school. The Nash Neighbors program is a partnership between St. Mark’s UMC and E.C. Nash Elementary School which began in late 2002 when St. Mark’s decided to adopt Nash Elementary. Located in the Amphitheater School District, in one of Tucson’s lowest socio-economic areas, Nash has a 100% ‘free and reduced’ lunch rate and 50% student turnover. In addition, as a Title 1 school, all students receive breakfast. Seventy-two percent of the students come from homes where English is not their primary language. Nash Neighbors seeks to assist in filling the needs of these underprivileged children, and to help the teachers and staff. What began as volunteers in the classroom has grown into a multi-faceted program, administered by the Nash Neighbors Committee — a sub-committee of St. Mark’s Missions Committee. The Nash Neighbors program now consists of numerous projects with a lot of opportunities for individuals and groups to get involved. The projects have been funded by grants, corporate sponsors and individual giving. In more recent years, Nash projects has been funded by receiving half of the Christmas offering along with monetary contributions from individuals and food contributions from the Tucson Community Food Bank. Vision: To promote social justice while leading by example. Values: As St. Mark’s Nash Neighbors, we will live the example of Christ by reaching out to the Nash community — showing mercy and kindness, and seeking justice. The committee oversees three large projects as well as several smaller ones. Do you hear a call to be a part of St. Mark’s inspiring mission at Nash Elementary? The Nash Neighbors Committee is an excellent way to support Nash, without necessarily going to the school site. Nash Neighbors organizes all of the church’s efforts for the program through quarterly meetings at the church. Please consider sharing your time and talents by serving on the Nash Neighbors Committee, or as a volunteer in any of our special project areas. Contact Carol Cecilia for more information, suggestions or questions. The very first effort in St. Mark’s partnership with Nash Elementary was a drive to put volunteers into classrooms and offices where Nash staff wanted support. Volunteers help wherever help is needed, from tutoring and reading to children, assisting teachers in the classroom and in the office, or helping in the cafeteria. On-campus volunteering continues to be one of the foundations of our Nash Neighbors program, and we always welcome new volunteers. Volunteer opportunities range from once a week to once a month. To sign up, or for more information, contact Melinda Sims. NOTE: All new volunteers must have their fingerprints taken and cleared by the Amphitheater School District before beginning work in the classroom. The process takes approximately 4 weeks to complete. You can get further information on this requirement by contacting Melinda. For many years now, St. Mark’s has provided students at Nash Elementary School with supplies to start the year off right. Our goal is to help them have a successful learning experience, without having to worry about having the proper supplies. Each teacher will receive a box full of basic supplies, to use or distribute as needed. During the month of July, the congregation can donate supplies for the school. A list of supplies requested will be listed in the Messenger in late June. For more information on how to donate supplies or how to volunteer, contact Barb Sargent. Supplies can be dropped off on Sundays at church. There is a Nash Supply box in the rolling donation cart in the courtyard. Or, drop donations off during the week in the office. No donation is too small—ALL is appreciated! When you read the Nash story, you’ll see we often quote the statistic about the school having a 100% “free and reduced lunch rate” as an indicator of the relative poverty level of the Nash family. What is perhaps so obvious that we don’t mention it is that that statistic also speaks to the level of hunger those families must endure. Many children eat consistently only because the school feeds them, which occurs only when school is in session. What happens to these families on weekends? They likely do not eat well. Imagine doing homework, or worrying about AIMS tests, on an empty stomach!! The Snack Pack program sends home a backpack filled with food staples and snacks to 120 students each Friday afternoon to help feed their families over the weekend. This program is conducted in partnership with the Tucson Community Food Bank. If you’d like more information, or would like to assist the team running the Snack Pack program, contact Nancy Jackson. We believe that the morale and welfare of the Nash staff is an essential ingredient for classroom success and have therefore created a Staff Appreciation program that reminds the staff how much they are loved and appreciated. Previous school year Staff Appreciation events included providing fruit baskets, filling coffee mugs with goodies, ensuring that each member of the staff received a Valentine treat, and gift cards. At one point, the Staff Appreciation program also performed a make-over on the Staff Lounge. In more recent years, we have provided an annual “Thank You Brunch” for the staff on the last staff work day before Christmas break. We have all found this to be a wonderful chance for the staff and the people of St. Mark’s to interact, without the distraction of children! To learn more about Staff Appreciation, please contact Carol Cecilia. Since 2004, individuals from the St. Mark’s community have “adopted” families at Nash Elementary at Christmas through this Holiday program. Adopted families receive gifts of grocery store gift cards, clothing, household items and toys through this Nash Neighbor’s program. Families can be adopted by individuals or, more often, by groups. Since the number of families that sign up for this assistance varies from year to year, please contact Carol Cecilia for more information. To promote continued learning during the summer months, St. Mark’s provides Nash children with ‘play school at home’ bags that are sewn by people of St. Mark’s. These bags are filled with school supplies and books to encourage children to play school at home, thus keeping up their skills. This is a recurring project that culminates with bags of supplies being distributed to the children at the very end of the school year. To continue the cycle again for each school year, we are always seeking sewers and looking for sturdy fabric (1/2 yard for each bag) and thread donations. Our goal is to provide 400-500 “play school at home” bags to Nash children near the end of each school year. Currently, Gail Blevins coordinates this project. St. Mark’s UMC collects empty inkjet printer cartridges and sends them in to Empties4Cash for $2.00 per cartridge, on average. Collection boxes are in the church office workroom and on the roll-away donation cart in the courtyard each Sunday, as well as on the Nash campus. Contact Jodi Lucio for more information. If your group is looking for a one-time, occasional, or on-going service project, please consider helping Nash. So far, Sunday school classes, men’s and women’s groups, Disciple classes, etc. have helped with projects such as organizing on-going clothing drives for the Amphi Clothing Bank, providing emergency food and hygiene items, painting the 3rd-grade hallway, building a ‘picture library” to assist in teaching vocabulary to non-English speakers, and buying uniforms. Contact Cris Mayerle, crismayerle@comcast.net, for a listing of available service projects.